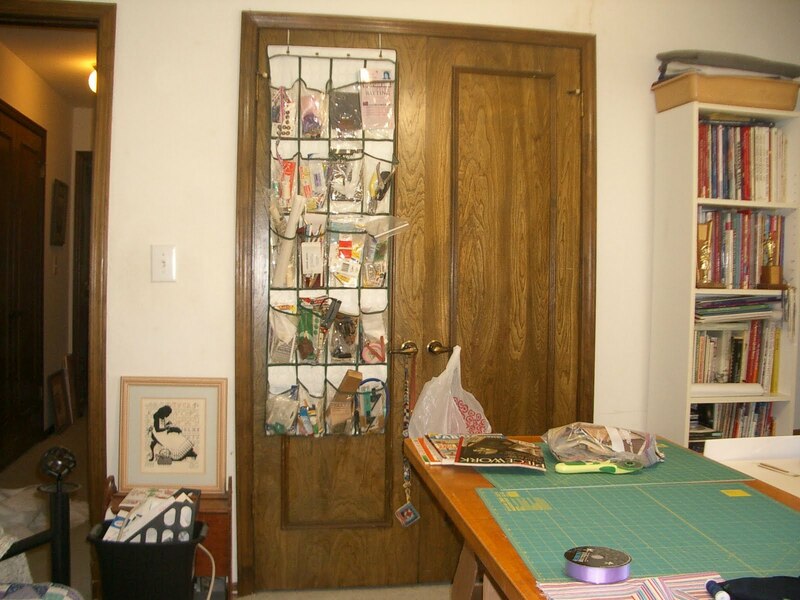 Elsie M. Campbell and Aunt Mimi's Quiltworks: WOW! It's September already! Elsie is an award winning quilt maker and teacher. She offers workshops and lectures around the world. It's about time! Summer was a whirlwind.....a very, very hot whirlwind! Record highs in Kansas and Oklahoma, and an all-time record number of 100°+ days, too. It was mostly survival of the fittest, it seemed. At least there were very few mosquitoes to swat, and Sally and Gianni certainly didn't want to go outside much, so we all got busy working inside to make 2205 Canary Drive our home. It is taking a long time to figure out where all 4000 square feet of stuff that came from the big house in Dodge City is going to go in only 1950 square feet of space in the new home. Right now, there seem to be boxes everywhere yet to be unpacked and stashed away. 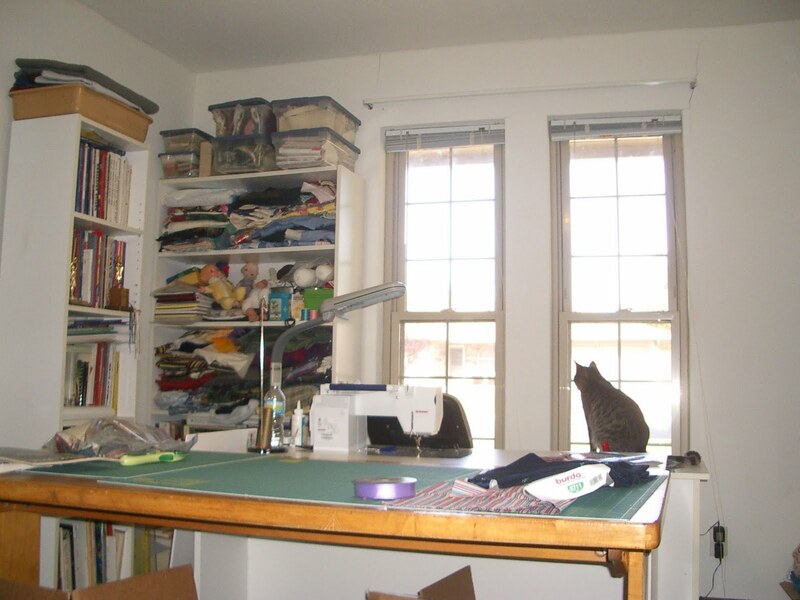 Gianni supervising the sewing area. 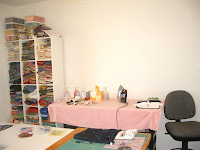 My sewing room is up and running (kind-of). 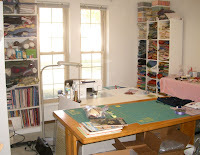 There are only two feet-wide aisles around the sewing center and the pressing table, shelving units, and guest day-bed. The closet is packed full, even though I've given away, e-bayed and garage-saled over 600 books, masses of fabric, excess equipment, and thread. And then there is the quilts. Lots and lots of quilts. 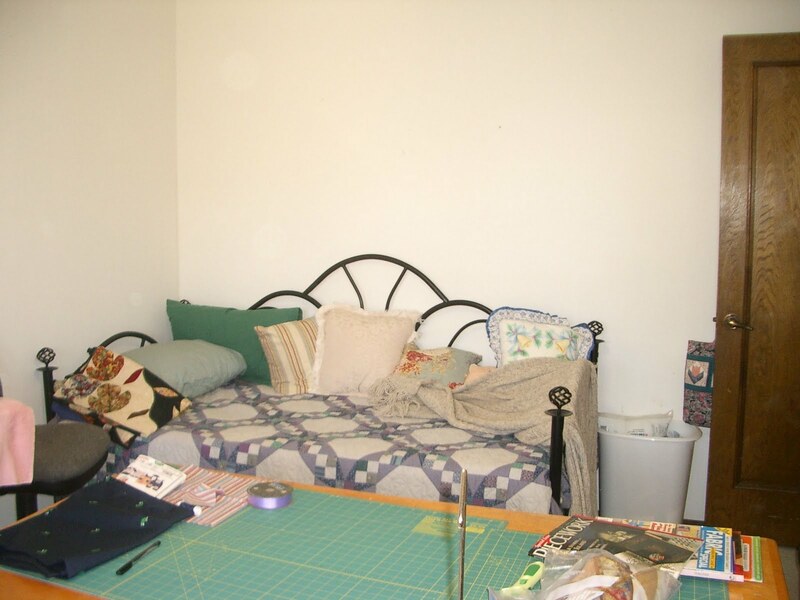 My husband's grandmother Laura Kassik once reminded me of how important it is to share my quilt bounty with others: Years ago, I asked her about what had happened to the many quilts and quilt tops made by her mother, Ken's great-grandmother, Alice Cayot. She replied, "Oh, don't you remember, honey? All of her quilts were lost when her house burned down. The only quilts that survived her were the ones she gave away." The ONES she GAVE AWAY! Isn't that a lesson in life? 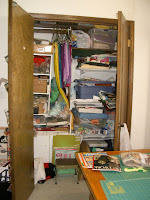 When I look at my closet bulging at the seams with quilts that I cannot possibly use up in my lifetime, I decided it was time to distribute some of them on to people who will appreciate them. My sons and daughter-in-law, my web designer and dear friend Ruth Hirsch, our brother and sisters, nieces and nephews, and charities like the Mennonite Central Committee Oklahoma Relief Sale. I can think of so many who would benefit from a quilt or two. I certainly have enough to go around, and will still have enough left over to use for my trunk shows. What a blessing it is to be able to make something that has love stitched in every inch, and that can offer comfort and warmth to another person, or the opportunity to provide funds for a worthwhile organization. In the meantime, we are enjoying our new quiet neighborhood, and the cooler weather of this past week has provided a welcome break. We've been able to be outside, and I have one flower bed ready for the fall planting. There are 3 more gardens in various stages of preparation. 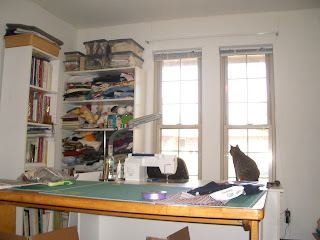 There will be plenty of time this winter to work in the sewing room. What a sweet post!! I think it is so nice of you to give some of your wonderful work to others. I know there are so many flood and fire victims right now who have lost everything that would love to have some beauty in their lives. I am so happy to see you back to posting! Oklahoma was green when we headed east to TN in mid June to escape the smoke in NM. When we came back in mid July it was brown and the cattle and horses were starving. This will be a year to remember. I hope the next one is better! Eager to see you creating again! Love your grandma-in-law advice about giving away quilts. Hard to do sometimes, but a very good idea! Believe it or not, I have been sewing, but haven't started a lot of new projects, just doing what needs to be finished: class teaching samples, a round robin that I agreed to participate in, things for our grandson Morgan (Sock Monkeys, etc. )I'm currently working on an outfit for his first birthday party. It should go in the mail tomorrow. And, of course, the house renovations have taken nearly all of my time this summer. Thank you for reading and responding to my post! Hard at work... or is it play? I'm taking advantage of this opportunity to communicate with my quilting community. I hope you will join me in the discussion of quilts and the quilting world. ©2001-2014 Elsie May Campbell & Aunt Mimi Quiltworks. Images and content may not be copied, printed or otherwise disseminated without express written permission of Elsie M. Campbell. - See more here. Elsie M. Campbell 2009-2012. Awesome Inc. theme. Powered by Blogger.